The CIA org chart shows the overall institutional structure for the America Central Intelligence Agency. You may have already heard about the agency quite a lot of times especially from Hollywood movies. In reality, CIA mainly offers civilian foreign intelligence support for the U.S. federal government. It deals with a wide range of security issues and activities, such as human intelligence system. Feel free to check more info from the CIA org chart example below. You may also wonder the difference between CIA and Federal Bureau of Investigation (FBI). The latter one is also a national level security department in the U.S.A. The most key difference is law enforcement. CIA does not contain any kinds of legal service for security aspects. Additionally, CIA mainly targets on the worldwide level, whereas FBI focuses on the domestic level. The Office covers a number of CIA directors for different sub-departments. In reality, the Executive Office reports daily issues to and cooperate with the White House for national security activities. Moreover, the Office assists the U.S. Army for military intelligence aspects. A series of Associate Directors also support the Executive Office for internal communications. The analysis department of CIA is often called as the Directorate of Analysis, with a former body of the Directorate of Intelligence. The team normally helps the U.S. President and some other national political agencies to determine national security issues, legal policies, regional analysis and so on. Some of the analysis centers cover the areas in Europe, Asian and Latin America. This part of the CIA org chart is in charge of collecting foreign intelligence resources. Some other key roles of the Directorate including coordinating human intelligence activities within the American government. Furthermore, the Operations Directorate ensure a better cooperation between the U.S. Department of Defense (DOD) and the CIA. The Directorate does research and manages advanced and innovative technical equipment in order to support other domestic agencies, such as the U.S. Army. So far, a great number of intelligent devices have been used for military purposes. 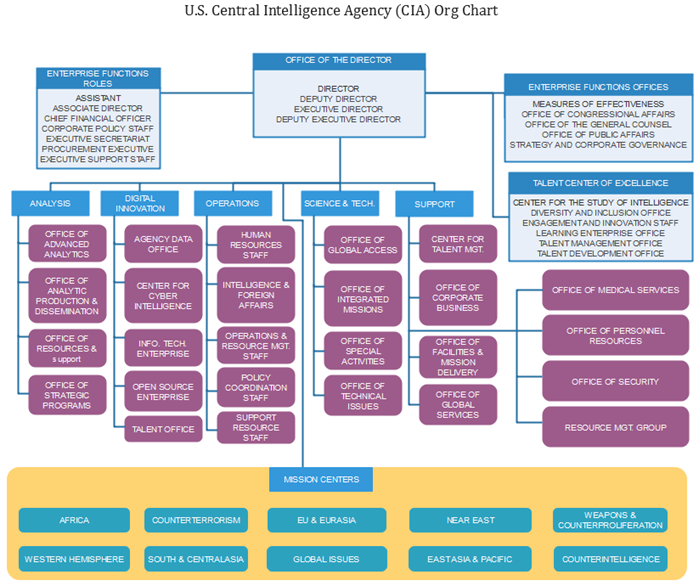 This part of the CIA org chart mainly provides daily administrative support for all of the Offices of CIA. Communications effectiveness and information technology are popular topics those discussed by the team. Ready for Your Own CIA Org Chart Creation? You can see all the necessary skills and info from the guide here: Org chart creator. Or you can try this easy org chart creator for more advanced settings and management of your business teams.